The diligence of the Holy Myrrhbearing Women is truly great and their fervent love for the Lord is constant. Free from every earthly predilection their hearts lived and breathed only for the Lord: all their thoughts, desires and hope were concentrated in Him and all their blessings and treasure consisted in Him. For the sake of their beloved Teacher they willingly leave their homes, their close and known relatives, forget the weakness of their gender, are not frightened by the cruelty of the numerous enemies of the Lord, steadily follow Him everywhere, long-sufferingly pass through the cities and villages with Him and minister to Him from their means. They do not abandon their beloved Teacher during His suffering and His death. Trailing behind with love, they accompany the Lord also to Golgotha and they look upon the Crucified One, taking measure of the compassionate feeling of His extreme suffering. Having disdained all the dangers of the frantic enemies of Christ, they finally come nearer, to His very cross and by their participation ease the unquenchable grief and illness of His All-pure Mother. Having fervently served the Lord with their means during His lifetime, they do not stop serving Him even after His death. According to their internal burning love of their Divine Teacher they will zealously render Him the final burial honor: the anointing of His body with aromatic spices (Mk. 15:40, 47, 16:1-2; Mt. 27:55; Lk. 23:28-31, 49-56, 24:1; Jn. 19:25). In a holy impulse to see and to visit the tomb of the Lord they forget about themselves, about their need for rest, do not remember the obstacles and dangers, and even the weakness of their gender does not stop them. Such is the true love of the holy women for the Lord. It is continual, pure and simple, deep and strong. The burning continual love, the sincerest unquenched diligence of the holy women was worthily rewarded by the Lord Himself. 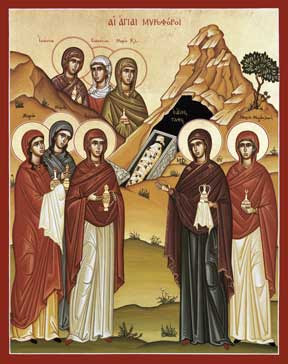 The Holy Myrrhbearing Women, who preceded every one to the tomb of the Lord, also went before everyone in the joy of the Resurrection (Mt. 28:1-10; Mk. 16:6; Lk. 24:1-11). From this time the holy women have become true witnesses equally with Holy Apostles to the resurrection of Christ for all the people. The ardor and continual love of the Holy Myrrhbearers for the Lord also serves as an example for our love for Him. By the example of the holy women, we also should strengthen in our hearts the true self-denying love for our Savior. Even the strength of our love for Him should be like those, as the holy Apostle says, that nothing could separate us from Him, neither things present nor things to come, neither life nor death, neither angels nor men (Rom. 8:38-39). Besides this, in the example of the Holy Myrrhbearing Women the Holy Church presents a spiritual healing for all Christians tempted with sorrows, leading to depression. Like the holy women, wounded with fierce grief during the scene of their Lord and Savior, crucified on the cross and buried in a tomb, however searched for unique comfort in that tomb where all their happiness and life were hidden and found this desired comfort, so it is that each Christian soul should seek consolation in the sorrows and grief at the tomb and cross of the Savior. Together with this, the life and labors of the Holy Myrrhbearing Women themselves represent an example of the true-Christian pursuit of the Christian woman. Her calling on earth is that this is according to privilege a life of the heart in all its lawful displays. An example of the Holy Myrrhbearers and the contemporary Christian woman is likewise called to serve the indigent from their means, to ease the situation of the disabled by their labor, comfort the sorrowful and the sick and, to care "not for the beauty of the body, not for the external braiding of the hair, not about gold finery and elegance in clothes, but about the secret heart of the person in the incorruptible beauty of the gentle and taciturn spirit, that is precious before God" (l Pet. 3:З-4; 1 Tim. 2:9, 12), i.e. about the development and improvement in the Christian spirit of internal spiritual qualities, especially of the good and loving heart. (See Rukovodstvo dlia Seljskikh Pastirej (Manual for Village Pastors) 1892, 15; Smolenskiia Eparkhialniia Vestnik (Smolensk Diocesan Messenger), 1891, 9). Read also The Myrrhbearing Women and the Christian Women of Today by Elder Sofian (Boaghiu).